TORONTO – A Canadian police department that is reportedly experimenting with new training methods recently had a group of new recruits participate in a meditation lesson at a Buddhist temple. On April 7, a group of approximately 35 police officers visited the West End Buddhist Temple and Meditation Centre in Mississauga, Ontario. The officers were all new recruits in training with Peel Region Police, which is a law enforcement department that serves the Toronto area. While at the Buddhist temple, the officers received a lecture from a Buddhist monk on “mindfulness meditation and Buddhist philosophy,” according to a report from The Mississauga News. 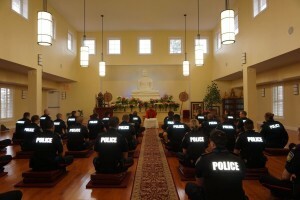 Photos posted on Facebook show the police officers, in uniform, taking up the cross-legged Lotus position inside the temple, with a large statue of Buddha in front of the meditation room. Lori Blashuk of Peel Region Police’s Diversity Relations Unit said their department is experimenting with new training methods and thought the visit to the Buddhist temple would be beneficial for the officers. “It’s good for the well-being of our officers, particularly with the stress they experience on the job,” she stated. According to The Mississauga News, the department is looking into allowing officers to attend regular meditation sessions at the temple. The Ontario Regional Police will be holding a similar session at the temple next month. As previously reported, a growing number of major corporations—including Google, Facebook, Apple, Target, and Bank of America—are offering meditation, mindfulness, and yoga programs for their employees. A number of Christians, recognizing these practices’ ties to New Age beliefs and Eastern religions such as Hinduism and Buddhism, have expressed concerns at their increasing popularity in the U.S.